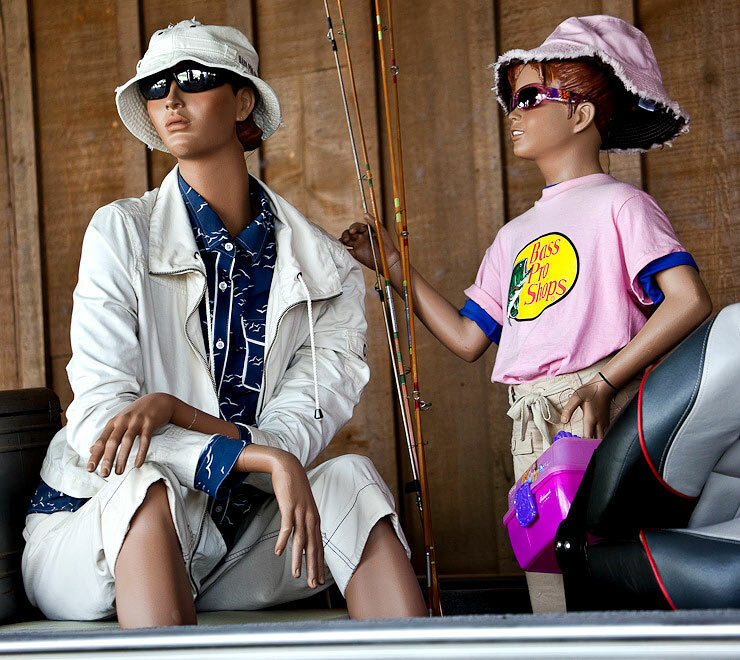 Mannequins gone fishin', Columbia, Mo. | Canon 5D Mk. II and 70-300mm f/4.5-5.6 DO IS lens @ 115mm; exposed 1/160 sec. @ f/5, ISO ISO 250. This past weekend, my parents came to visit me in Columbia and my dad brought with him his new 70-300mm f/4.5-5.6 DO IS zoom lens. It’s the only other “diffractive optics” lens made by Canon–the other being the 400mm f/4 DO IS super telephoto that he and I co-own with Dad. I’ve been curious about this lens for a while now, which is an obvious interest given that I have been more than impressed with the 400mm DO. It’s an impressive zoom range: sure, there’s the 70-200mm f/4L IS lens that I already own, and combined with a teleconverter you would get the same zoom range, but that combination weighs 2.3 pounds (1.05 kilograms), whereas the 70-300mm DO weighs 1.6 pounds. Add to that the cosmetic appearance of the lenses: the 70-200 is a white lens, and stands out in a crowd, but the 70-300mm’s only distinguishing mark is the green line around its barrel. And why not the other 70-300mm lens? The DO should be sharper, although I cannot do a side-by-side as I would need a 70-300 f/4-5.6 IS lens to test, but one thing is certain: it is more compact. 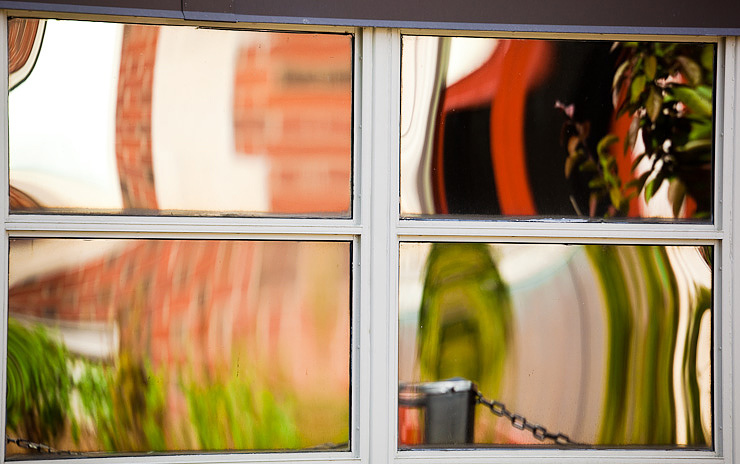 Gannett Hall reflections, University of Missouri School of Journalism, Columbia, Mo. | Canon 5D Mk. II and 70-300mm f/4.5-5.6 DO IS lens @ 275mm; exposed 1/200 sec. @ f/8, ISO 400. My time with this lens was relatively short, and the photographic opportunities somewhat limited, but I was pleased with the results that came from the lens. Was it tack sharp every time? Nope. But it’s difficult to say how much of that was the 5D Mark II”s somewhat haphazard focusing abilities and how much was the lens? 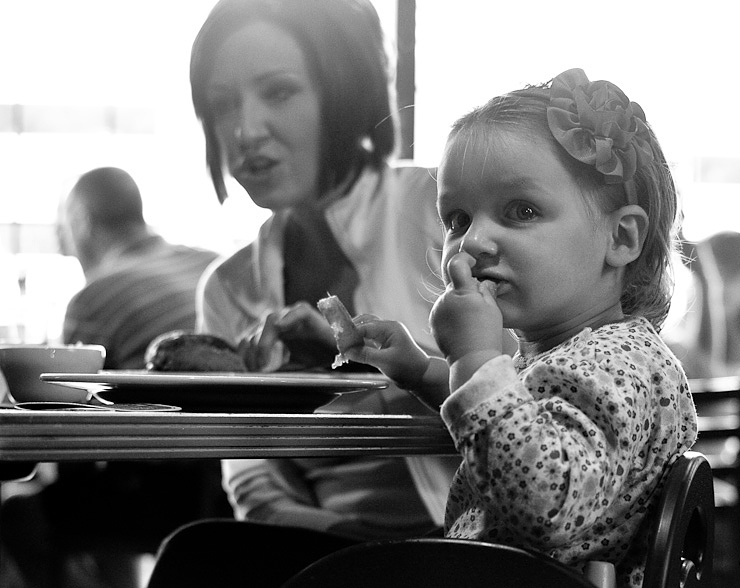 The exception to my personal "no photos of people eating" rule: Flat Branch Pub and Brewery, Columbia, Mo. | Canon 5D Mk. II and 70-300mm f/4.5-5.6 DO IS lens @ 70mm; exposed 1/30 sec. @ f/4.5, ISO 1000. What I can say is that, while this lens could never replace a dedicated 70-200 mm lens, I could easily see using this lens in lieu of its more “professional” cousin for travel photography because it’s smaller, lighter, and makes images that I would still be more than happy to frame or to sell. Go to Europe and take this lens and the 35mm f/1.4L and you’d be set for street photography!